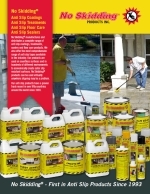 Liquid, solvent-based sealer protects exposed edges of slip-resistant tapes and treads from excessive moisture or liquids. One 5-ounce tube with convenient tube applicator seals approximately 75 to 100 linear feet. 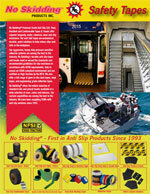 For sealing edges of anti slip tape walk that are exposed to excessive water, grease or oil. Edge Sealing Compound can be walked on within 30 to 60 minutes after application, and will reach a full cure in 24 hours. The Edge Sealing Compound is a flexible acrylic and will never get rock hard. It is designed to prevent moisture from penetrating under our anti slip tape. It is recommended to wait the full 24 hours before submerging under water.